It took me five years to produce a 300-plus-page dissertation on early modern utopias and another five to turn it into a monograph that would eventually sell 487 copies. And yet, in a matter of a weekend morning, I could produce a chapter—a chapter!—of sparkling, exclamation-studded prose about those Wakefield girls. The Elizabeth in me loved the discipline, the reminder that while my twenties rolled on and I trudged back and forth from Eliot House to the library, lugging books in my arms like a woodcutter, I was producing pages—daily, weekly—that were being turned into actual books (OK, books with pastel covers, books without my name on them anywhere, but still! )—books that were selling, that were being translated (Hebrew, Danish, Dutch), that generated fan mail (OK, addressed to Francine and not to me). Books girls loved. The books I wrote as Kate William, the “author” name that came built in to the series, had readers. I got a lot of great suggestions for solutions to my Scrivener to iPad dilemma. Ultimately, I ended up breaking down and buying Pages. I’m a sucker for design, particularly when I’m writing, and Pages is pretty, functional, and easy to use. I realized that there were only a few documents I was actively working on that needed the formatting preserved—my conference paper, a couple sections of my dissertation chapter, some miscellaneous notes. Those I converted to word and opened in Pages before I left for the conference. Everything else—most importantly, most of the notes and evidence for the current chapter—I exported from Scrivener to a Dropbox folder so that I could access it with Simplenote if I needed it. As systems go, it worked pretty well. I got some writing done in the airport and some more done the day before the conference. The Bluetooth keyboard from my iMac worked seamlessly. As is always the case, once the conference started all my plans to work on my chapter went right out the window, but given what I managed to accomplish before and after the conference, I wouldn’t call it a complete wash.
One of the major benefits of being on fellowship is being able to write from home every day, rather than in my tiny windowless basement cubicle on campus. I know there are a lot of people who aren’t able to write at home, either because they don’t have enough space or a space that feels sufficiently work-like, or because they need people around them when they’re working. The latter folks tend to work in coffee shops and often find that the presence of other patrons, even if they are strangers, provides a sense of accountability that keeps them working. The former folks work in on-campus offices, even on days they don’t have to be on campus. As I’m fortunate enough to have an office at home, that’s where I prefer to work—it’s where the books are, after all. 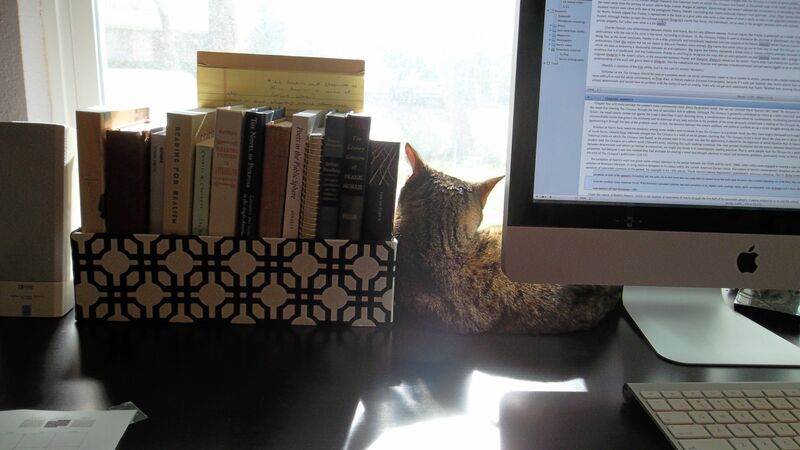 But when I only worked at home once a week, my desk would be piled with books, papers I’d brought home to grade or file, bills that needed shredding, and a sizable accumulation of cat fur, since both cats think the desk is placed where it is to provide them with a prime outdoor-viewing spot. And when I had only one day a week to work at home, there were always pressing things I needed to do with that time, so cleaning the desk, not to mention the office, was never much of a priority.